Note the two knobs, & switch placement. Going through the Washburn pricelists, I noted that the 1996 version -- the last year as the "Billy T" line before becoming "Maverick" -- had only a single Vol knob, but this notation is lacking thereafter. FWIW, the only model to have the 621/623 pickup set was the BT-10. Maverick BT has a nice offset shape that is quite comfy.. some other brands have almost the same outline. EV and EB brand comes close. Because I have upgraded my BT6, I guess it is more than a capable versatile shredder. As they do, time-to-time, MGR has allowed the stupidest coders on staff to tweak the search protocols. For instance, you'd get ZERO hits if you search for Washburn HB or Washburn 35 or even Washburn HB-35... yet it happily pulls up a hit for Washburn HB35. I mention this here because BT3 & BT-3 will get you different results, & nothing at all for BT. This is a bit more in my range, at $275... but my budget is zeroed for a month or three. Fortunately, the vinyl decal is easily removed, but maybe you dig Sammy more than me. Though fully eight digits, it's on a BT-2, so 1996-2000. If the serial number has any date validity whatever, the guitar is 1998, a one-digit year code. This, of course, messes up some of my theorizing. I'd assumed that the guitars went from being "Billy T" to VERY briefly "Bantam"** until fetching up as "Maverick." The model (the only lefty in the series) doesn't appear until the 1998 pricelist, while "Maverick" was applied fully a year earlier, so I'm puzzled. ** -- intending to repurpose the "BT" prefix, but I think Grover Jackson balked as the name was already in play for the XB basses which had his name on every headstock. As a further guess, Jackson may have said "pay me" for the implied association, & Washburn moved along. 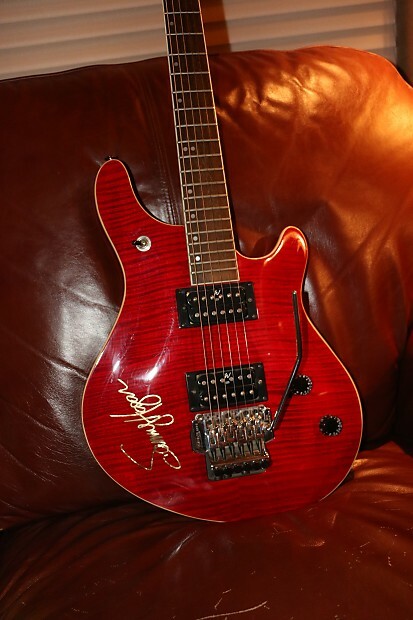 The EVH (Fender) "Wolfgang Special"
#3 is a Richie Castellano Axis, #4 an Axis, & #5 an Eddie Van Halen. Greatest difference appears to be hang-point &/or horn length. I picked up a rather poorly BT9 recently - apparently it had been used in a video for a Metal band where unspeakable atrocities were committed unto it. It had also had a coat of rattle can white paint applied to it. That came off without too much of a struggle and I was left with a decent guitar. It needed a new volume pot and a little tweak of the wiring and it's sounding good. It's just lacking a couple of things...a tip for the pup selector (30 seconds on eBay should sort that out...) and a whammy/tremelo bar/arm. Now that's proving harder to find...It's the fulcrum type of trem fitting. 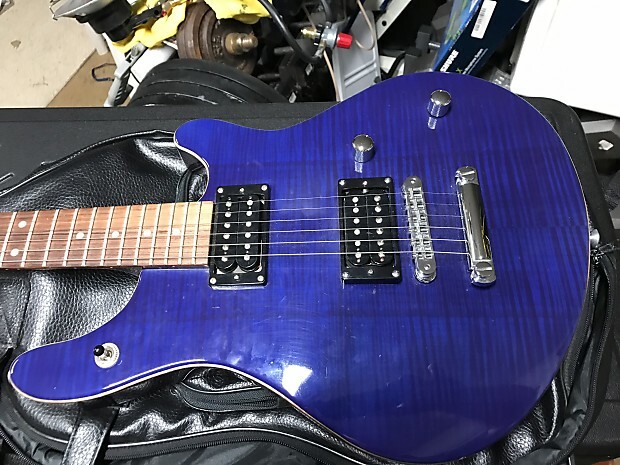 It doesn't necessarily have to be a Washburn part, I just want one that works - any thoughts or places I can look to find one please folks? Nice catch!! Washburn has not made many maple-fretboard models in the past 40 years. 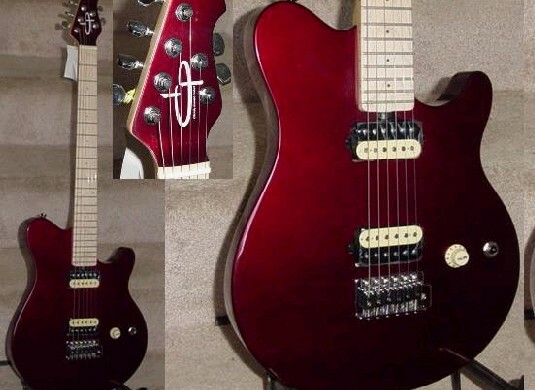 If I were to go insane on the "EVH" thing, I'd considered swapping necks between a BT-10 & BT-9. As it happens, I have a BT-3 within reach, & the vibrato arm I got on a BT-6 -- sure enough, it matches up just fine. I'm going to hazard a guess that your BT-9 would use the same size as well. While I don't have any measuring devices handy, this arm is definitely more robust than one that fits a Squier Standard & a Mexico Fender. I'm therefore going to guess the latter is a 5 mm ("M5") size, & the former is 10/32" a.k.a. "USA" size. This just now strikes me as odd. I know of the two major applicaions of the 10/32 thread: California-made Fenders, & Gotoh bridge assemblies. Does this mean the Mavericks have Gotoh bridges...? 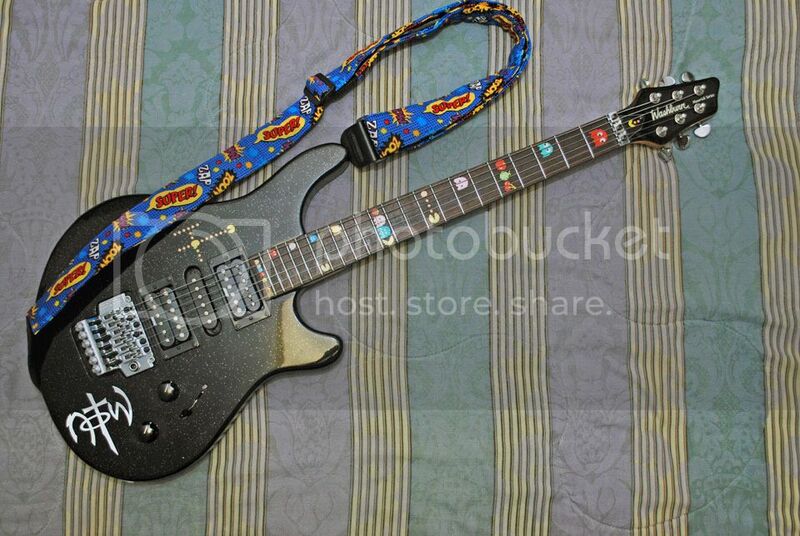 Guys, that's my guitar... i bought it second hand many years ago and it was already "modified/customized"... I never really understood which is the model (well, it's a Billy T., but i can find enything else). 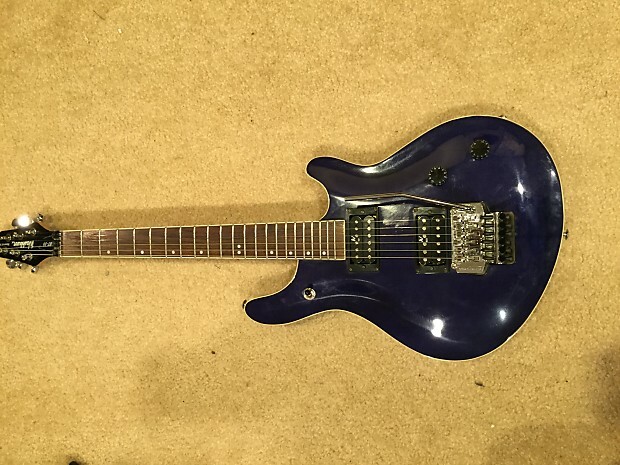 It has HSS and a Floyd Rose bridge. The serial number is "6112473". Could you help me to know something more? Thank you!! 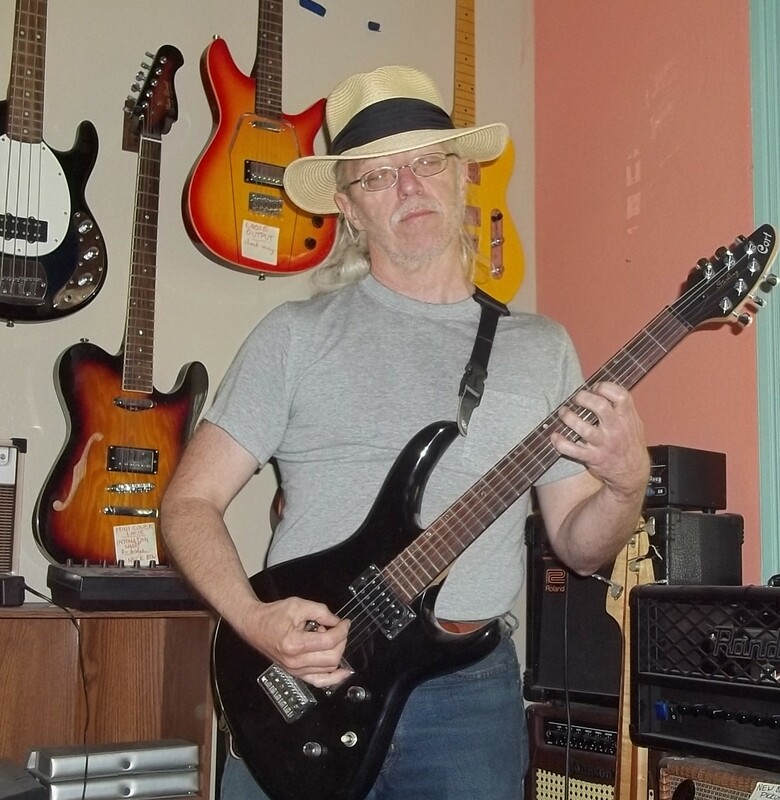 The BT-9 was the only BT with maple fretboard. The BT models with Rose system were BT-6 (hss), BT-10 (hh), & BT-20 (hh). Is there any indication the bridge is a later addition? At a wild guess, I'd say you have a short-lived "transitional" guitar (or a short-run "demo"model) as the line went from "BillyT" to "BT" naming. It certainly has the BT-9 style pickguard (which only the BT-9 & BT-3 had). The only BT that had the sunburst were BT-4 & BT-20. As the BT-9 were only around 1996-1999, that'd put yours at the early end. As I showed previously, these appear to have used only the first digit for year, which does appear to make yours a 1996. I found a random 2006 comment from Customer Service about Mavericks, so figured I'd put it here. YOUR GUITAR IS A MODEL# BT4B. IT WAS PART OF OUR "MAVERICK SERIES". THE LETTER "B" AT THE END OF "BT4B" REPRESENTS THE BLACK PAINT COLOR. YOU APPEAR TO HAVE THE BLACK VERSION. IT WAS BUILT UNDER CONTRACT IN 2001 BY THE SAMICK GUITAR COMPANY FOR WASHBURN. WAS A VARIANCE ON THE USA-BUILT JENNIFER BATTEN ARTIST MODELS. CONTAINING A PORTION OF THE 2001 THAT PICTURES YOUR GUITAR. PLEASE ENJOY YOUR GUITAR, YOU GOT A GOOD ONE. Valuable for confirming that BTs (the later ones, at least) were indeed Samick. The JB models were offered 2000-2004. The Mavericks were around 1995-2002. Nope, not done yet with my fandom. ...but with gold hardware AND minibuckers. The seller says its s/n begins with a 4, guessing it at 1994; he seems to know a little something about the model at least.